Most of the designs we create are for women, children or home décor. We have a few selections for men; those designs were mainly designed to worn on denim shirts or sweatshirts and feature large designs. We wanted to create a collection for men that was subtle and could be worn everyday. We designed an assortment of 50 different designs that are all approximately 1.5” in size. 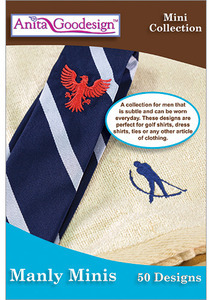 These design are perfect for golf shirts, dress shirts, ties or any other article of clothing. Best of all they are all only 1 color so they stitch quickly! There are dozens of different hobbies and occupations covered in the Manly Minis collection, we are sure you wont have a problem choosing a few to start with.